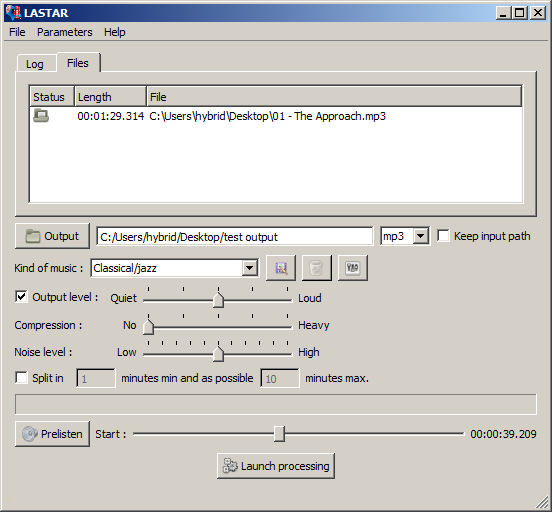 LASTAR is now portable. Setting saved in application folder. Version tested 1.2.9. Please move to the submission forum. Thanks. It is freeware (gpl licence), runs on Windows XP 32-bit and better (works fine on Win 7 64-bit). · Correction: issue in compression mode, which was leading to audible distortion when combined with multiband mode. Added : integer 8 to real 64 bits support in Wav output. The bit depth of output is now the same as the input for Wav files. * Splits music into audio segments, which can be great for making long recordings easier to navigate by creating chapters. The splitter works on silence (and can be modified for more or less noise sensitivity to split your tracks). * Wish I understood better what this is supposed to do. It re-encodes the file so this isn't one of those lossless audio normalizers. There's a lot of advanced audio settings that seem to require some strong understanding of audio tech. Fortunately the included help PDF file gives some greater detail. Will dig through that and come back to this if I get a chance. So a new version came out a few months ago and was looking to retest, but the latest version requires MS Visual Studio Redist, which I was unable to find a working link/download for so ... maybe someone else will want to mess with this.